(WILLIAMSTOWN, Mass.) – It turns out the Marx Brothers were Marxists in more than just name only. Their pointed, slapstick humor was really social satire way ahead of its time, as can be seen in the terrific, entertaining production of their George S. Kaufman musical, Animal Crackers, running at Williamstown Theatre Festival through Saturday, July 13, 2013. The show at WTF captures the Marx Brothers in all their chaotic zaniness. 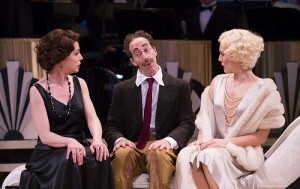 The thin thread of a plot such as it is – the theft of a painting at a high-society party being thrown in honor of explorer Captain Jeffrey T. Spaulding on Long Island – is just an excuse for the dizzying verbal pyrotechnics of Groucho, the slapstick comedy of the silent Harpo, and the instrumental wizardry of Chico, played here almost to a ‘t’ by Joey Slotnick, Brad Aldous, and Jonathan Brody, respectively. Brody is pitch-perfect as Chico, or Emmanuel Ravelli, as he is known in the show. 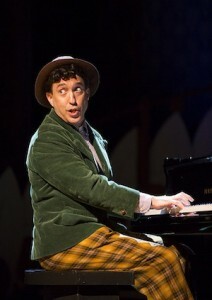 In particular, he has Chico’s odd accent down, as well as his comic timing on piano. Slotnick captures Groucho’s manic glee and insolence, building upon the character, however, so that he seamlessly ad libs his own jokes, referencing this production, the audience, the forthcoming WTF season, and presumably whatever pops into his mind on any given evening. It works, and makes the show fresh and exciting. It’s not all about the Marx Brothers, though. This sort of entertainment came historically between vaudeville and the fully contained Broadway musical as we know it, so it has elements of both. The song and dance numbers here, in particular, are gorgeously rendered – the cast boasts terrific voice – but it may well be the dancing that wins the prize of the evening: a perfect blend of flapper-era steps like the Charleston with some very contemporary suggestiveness. The production numbers may have little or nothing to do with the plot – they may just be excuses for another form of entertainment – but it’s easy to surrender oneself to the joy and talent that parades here onstage. The show is smartly staged by Henry Wishcamper, who also adapted the original book from the 1928 musical, and integrating bits from the 1930 movie version, too. Wishcamper has the live orchestra occupying center stage for the entire evening, working many layers and levels at the same time, contributing to the party atmosphere as well as the wink and a nod that what we are seeing is stage entertainment. Wishcamper also has fun with some very non-traditional casting, which only serves to underline some of the more serious social commentary underlying the comic hijinks. The Marx Brothers took all kinds of people to task in their work, especially in Animal Crackers, for pretending, pretense and pretension, and sent them up gloriously, none more so here than the character of Roscoe W. Chandler, who affects the role of a Southern millionaire, but who in fact is Abie the Fish Peddler, whom they recognize from “Czechoslovakia,” which serves as a euphemism here for the Lower East Side.